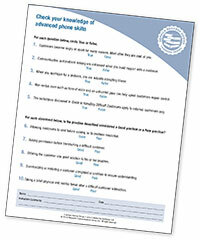 Your training package includes 10 booklets, plus a downloadable leader’s guide, quiz, and certificates of participation. 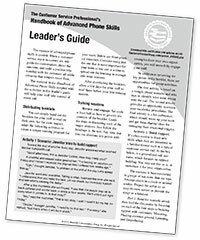 Handbook of Advanced Phone Skills will show your reps how to take their phone skills to the next level and handle each call in the most positive, efficient, and complete manner possible. Your package includes 10 copies of the Training Booklet, one copy of the Leader’s Guide, and downloadable Quizzes and Certificates. The Training Booklets may be used on their own as a handout or you may conduct more formal training sessions with the Leader’s Guide, Quizzes, and Certificates. 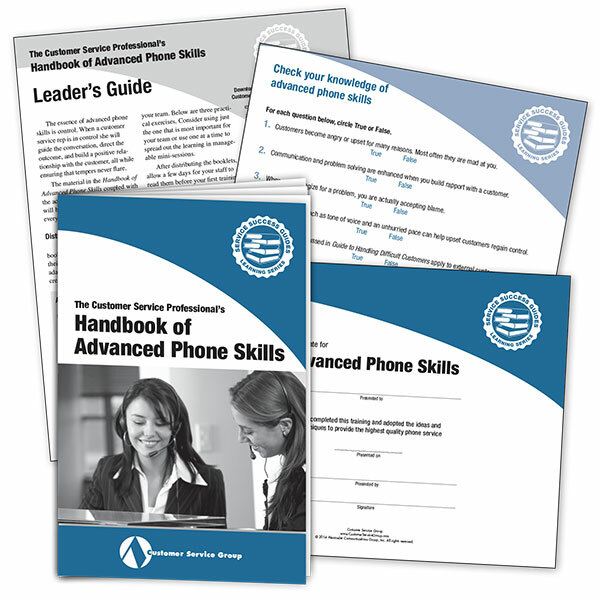 If your reps are ready to move beyond the basics to advanced phone skills, this information packed training guide is for them. The guide focuses on all aspects of maintaining control of the call and ensures that reps are guiding the conversation, directing the outcome, and building a positive relationship with the customer. Read the table of contents and sample below to see how much useful information is packed into this brief booklet. One of the most important advanced phone skills is building rapport, or a connection, with customers. It is equally important whether you have a small group of customers whom you work with on a regular basis or if you are on the phone for just a few minutes and may never speak with the caller again. Creating a connection will put the caller at ease, encourage a smooth, conflict-free interaction, and leave a positive and lasting impression on the customer. Customers are often pressed for time when they call a customer service center. And reps are often equally pressed to handle calls as quickly and efficiently as possible. That leaves you only moments to put customers at ease and begin building rapport. The following steps will help you make the most of that time. Use mirroring techniques. We often feel most comfortable and relaxed with people who are like us. This basic fact of human nature can be used to help build rapport over the phone by “mirroring” what you know about the customer. For example: his or her rate of speech, voice tone, volume, and word choice. If a customer is speaking slowly and softly and using nontechnical language, you should do the same. But if the customer is clearly rushed, speaking quickly and forcefully, and is comfortable with the jargon in your industry, try speaking the same way. Nothing will rattle the quick speaker more than a slow speaker and vice versa. To help you get the most from your training materials, you’ll receive a copy of the Leader’s Guide. It will show you how to introduce the materials to your staff in a positive and motivating way. How to reinforce important points in the booklet. Plus techniques to keep the message fresh long after the booklets have been distributed. Best of all, you don’t have to be a professional trainer. The Leader’s Guide includes discussion topics, activities, trainer’s tips, and more. Read the sample below to see how much useful information is packed into a brief section of this Leader’s Guide. It’s often easiest to learn new skills when they are presented in a familiar format such as a typical customer service call. In the box below (Not included online. ), is a generalized call scenario, which focuses on rapport building. You may use this as is, or customize it for your organization. The exercise is best conducted in groups of not more than six reps. Arrange chairs in a circle or around a table. Project the script on an easy-to-view screen or provide the script as a handout. Part 1. Read the scenario aloud, then lead the discussion by focusing on each of the four steps to building rapport with customers: Mirroring, Finding common ground, Listening, and Empathizing. Common ground: No. Everyone has a vacation. Jennifer could have found common ground by sharing her hope that the caller enjoys the trip or has good weather. Listening: No. If Jennifer had been listening, she would have known that the customer needed the tent on Friday, not in four weeks. Part 2. Now that everyone has had a say in what went wrong with this call, it’s time to role-play the call to get it right. Ask for two volunteers or have supervisors or team leads act the part of rep and customer. The two participants should sit back to back and move through the script with one rep reading and improvising the customer’s part and one rep responding appropriately. Use these certificates to acknowledge significant learning and development, and to provide motivation to put new skills into action. 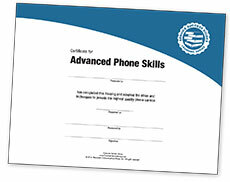 Certificates may be downloaded, personalized, and printed. A brief quiz is included to ensure that students have retained the most important information and are ready to put it into action. Quizzes may be downloaded and printed. 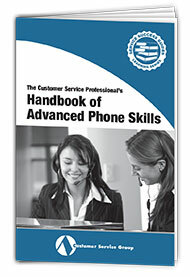 Handbook of Advanced Phone Skills is guaranteed. We want you and your reps to use this valuable resource and put its ideas to work in your department. Then, if you are not 100% satisfied, you may return your materials within 30 days for a full refund. The Customer Service Group provides ready-to-use tools for customer service training and frontline motivation including a monthly newsletter, training packages, DVDs, and Customer Service Week celebration materials.